2 years later Cinéma du Désert is back in West Africa for a 5 month expedition. Once again we took our vehicles from Italy to Burkina Faso. The tires of our beloved truck "Maggie" touched her 3rd continent on her 42nd birthday! During our way to Burkina, the film screenings were focused on climate problems, future outcomes s and possible solutions. On arrival we joined the CinemArena project. Together with AICS and local partners we set up the first of four campaigns focused on: "Awareness about the risks connected to 'illegal' migrations and discussion of alternatives". We touched the most remote villages in the central Eastern region of the country were Garango has the highest increase of youngsters leaving their homes to try "l'aventure" of arriving to Europe through the desert and the sea. A personal record: 60 villages, 60 screenings in 80 days! Check out the video for more details about our adventure! Cinéma du Désert worked as a technical, logistical and screening content partner for Cooperazione Italiana. The Cinema du Desert team has joined the "Carovana Artistica" to reach the border between Greece and Macedonia where thousands of refugees are stuck for more than 100 days… We visited Idomeni's informal refugee camp and also Eko Station, Jungle, Hara Hotel, and other official refugees camps. In these places we screened Charlie Chaplin’s “Modern Times” creating an unique moment of joy and fun for the audience. In the mean time we cooperated with “Ospiti in arrivo” ONLUS and “Deltaprocess” to promote circus and art workshops in the camps. Lots of emotions and a lot of new questions arose about this current "human crisis"
We reconnected with many people we knew from our first visit. They moved out from illegal camps (at the border with Macedonia/Skopje) to governmental camps around Thessaloniki. Our mobile cinema moved every night to a different camp, trying to reach as much people as possible, we managed to organize screenings in 8 different places. We screened Charlie Chaplin, "The boy and the world", Tom and Jerry and also the videos that some friends made about our first expedition: Carovana artistica Udine-Idomeni (may-june 2016). It was nice to see everybody looking for each other in the videos and smiling a lot when recognizing their friends on the big screen. We trust these cinema sessions were a good form of "healing" and we always had an incredibly good feedback from the audience! We want to thank all the people who helped us to realize this tough mission, especially each and every association and organization who were out under the sky with us during the screenings. A special thanx to "Help RefugeesHQ" for guesting us in their warehouse, "Philoxenia" and "Soul Food Kitchen" for letting us be part of their amazing project! On the road to Mongolia! 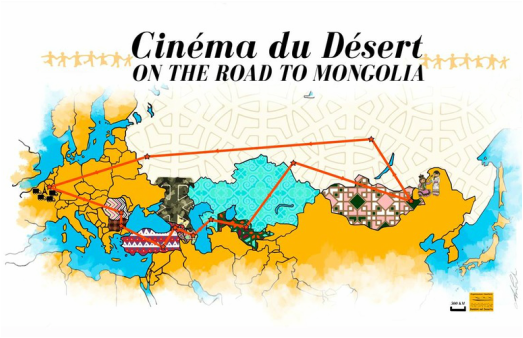 For the first time since the launch of Cinema du Desert we ventured out of Africa and took our solar mobile cinema across Siberia until Outer Mongolia. We wrote the project "Parallele 49" in partnership with the french association Lézards Migrateurs. After a month spent converting a 40 year old fire truck into a mobile cinema and home, we set off from HQ on 26 March 2015. Our route - loosely following the ancient Silk Road - crossed 12 Countries during 8 months and brought untold joy, fun and educational movies to those we met. We met a lot of children, associations, schools and youth centres that awaited our arrival between Italy and Ulaanbaatar (Mongolia). Over 40 film screenings organized and 2 documentaries were shot during these months. Follow our expedition: click here. One self-build Expedition Truck, seven volunteers and three dogs: 15.000 kms. over another six months (2014) from Bologna (Italy) to Ouagadougou (Burkina Faso). Bringing cinema to the most remote villages, getting in touch with the locals through the screening of eco-awareness documentaries and cartoons for the younger audience. The team met nomadic tribes of the Sahara and the Sahel and raised public awareness regarding FGM (Female Genital Mutilation) through the screening of videos about the subject; gave workshops about personal hygiene in several schools; and were hosted at an orphanage built and supported by the italian NGO Bambini nel Deserto. In Maninkoura (on the Mali-Guinean border), an isolated area without electricity or roads and a population of 30.000, we built (together with the local NGO Kaira-So), a solar powered community-run FM Radio Station - which took the name of huge river that provides them their vital water source: the Sangarani River. The station is today a tool for self-sufficient information sharing. Furthermore, we brought safety working gear to the blacksmith of our "Ferro e Fuoco" project. With our truck we also delivered all the tools for another groundbreaking project called "Garage Italia" run by BnD in collaboration with Motul Corazon Foundation. Helping street kids from impoverish backgrounds to learn a new trade and change their lifestyle. It was not always easy but we did it! The expedition was entirely founded by the italian "Otto per mille della Chiesa Valdese". Official Partners: Marangoni Pneumatici, officina TecnoDiesel. Documentaries and cartoons were screened for more then 12.000 people in Morocco, Mauritania, Mali and Burkina Faso. Diary of the expedition click here . Photo-gallery of the expedition click here. The "Truck 4 Afrika” expedition started from an accidental blend of wishes and the availability to turn them into reality. The Photographer Roberto Gabriele and the InGaeta Company had an ongoing project to create the biggest non-governmental solar power plant to pump water at an oasis in the village of Tata, Morocco and… we loved the idea (!). For that matter we drove an half ton stainless steel structure down there and won a Global Energy Award for it which we are really proud of!! See more here. Donated more than 20 computers and gave workshops to local school teachers about how to operate with the Ubuntu operative system. Began the recording and audio mastering of Malian musicians - to offer them the possibility of owing their own demo cd's free of charge. In Ouagadougou (Burkina Faso) we parked, once again, at the Centre National des Personnes Handicappes and, thanks to the amount of good will and friendship we received from our local friends, we organised an All Day Festival for children and people with disabilities - with traditional dancing, music, theatre and, obviously, CINEMA! Curious? To check out the photo gallery of this expedition: click here. Bologna: nine people gathered around the same expedition. The goal was to depart on three trucks for the fulfillment of a long awaited dream. To go where most don't: Africa. After many months preparing the convoy this heterogenous group of activists and artists was finally packed and ready to go! A six month long trip, over 15.000 km by land. The goal of the journey was to bring medical equipment and school supplies where they were truly needed (given to us by the Bambini nel Deserto NGO). We saw true poverty with our own eyes but we were confronted with real beauty and friendship as well. A different kind of freedom, a different kind of happiness, a completely different way of life. The thrill of discovery of a far away culture. Realizing what we all have in common, our humanity. Sharing is the human language! Equipped with an audio & video mobile studio and with all it was necessary to set up an open air cinema under the stars... AFREAKS was a great adventure and a success that changed our lives forever! This is how we started. This expedition was entirely self-funded by the team. "What strikes me is the fact that in our society, art has become something which is only related to objects, and not to individuals, or to life"